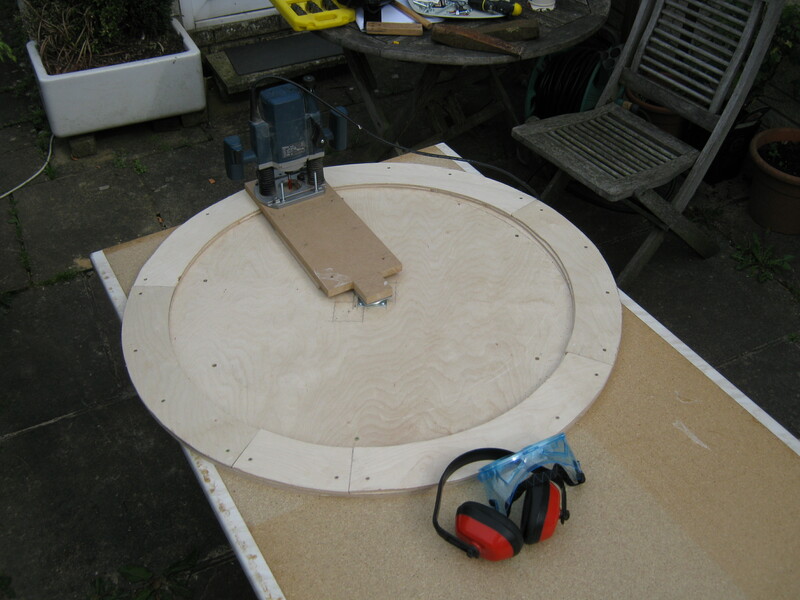 One of the key challenges of this layout was building a reliably operating turntable of nearly 3ft in diameter – without that the whole concept was a non-starter. An internet trawl revealed that various people had (surprise, surprise) already done this and there were even commercially available turntables that would fit the bill. However, not surprisingly, these were all available from the United States and getting any of them to the UK would cost a small fortune. 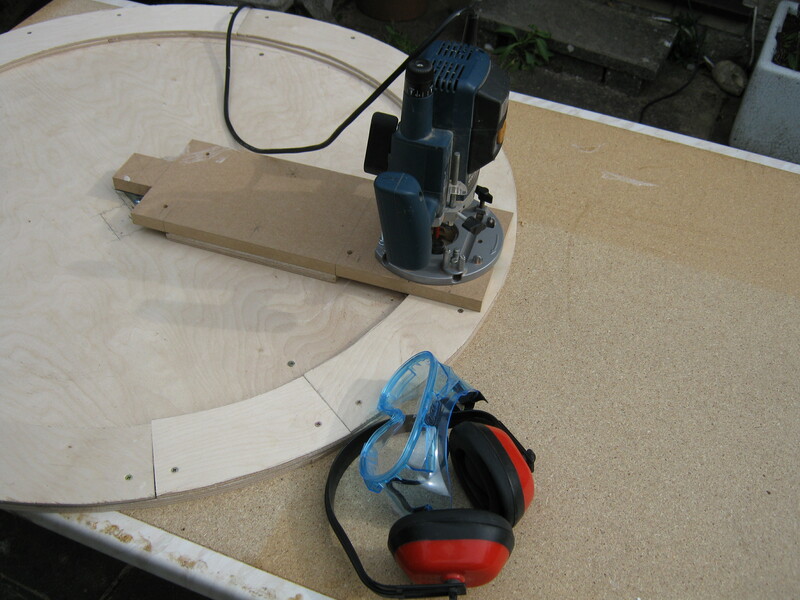 I decided the only thing was to have a go using techniques I was already familiar with – plywood and a router. 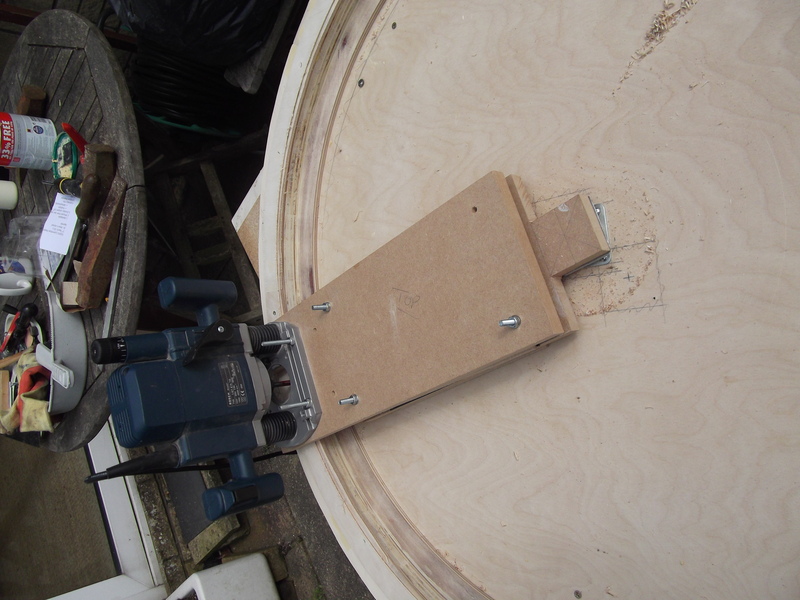 The turntable well was routed with the router bolted to a plank of wood pivoted at the centre point by the ball race I intended to use for the table itself. Whilst this was quite a slow and painstaking process it did produce a reasonably circular result (within about 1mm or less) that was reasonably light and pretty rigid: a good start! The table itself was made from a piece of aluminium extrusion that had been lying around for ages looking for a use – it started life as the frame for a sliding door at the front of our house. When the door was replaced the frame looked too useful to discard and so it proved. 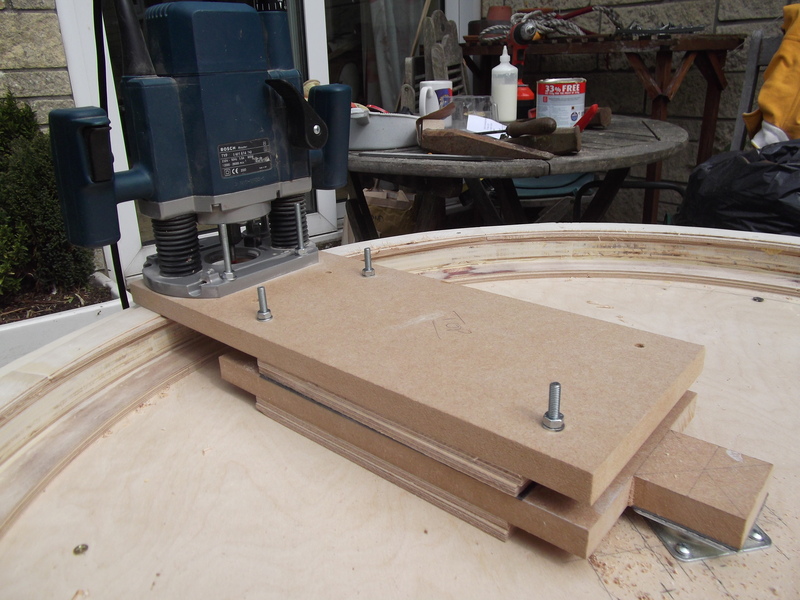 My initial attempt at a drive mechanism was fairly simple and straight forward: a motor running with a 128:1 gearbox driving a slot car wheel and tyre running on the turntable rim. Track power (and power for the table drive – both being DCC) was from the rim rail and a small circle of rail close to the centre of the well. This worked remarkably well: the drive turned the table slowly and smoothly and lining up the tracks could be done very accurately by eye. This was fine for home operation where it’s easy to move around the layout to be in the right place to line up the tracks visually. I soon discovered when part of the layout made an early appearance at the 2015 Gauge O Guild Bristol Show that this was a complete non-starter at an exhibition – unless you could stand looking down the track lining up the table with an approach track was nigh-on impossible. A new solution was needed. This presented itself in the form of Norton Jensen (a fellow O-scale Union Pacific modeller) recommending the New York Railway Supply PTC-III system – a stepper motor based hub (rather than rim) based drive. This has a full indexing system so that, once programmed, the turntable merely needs ‘telling’ which track to turn to and it finds its way there. This involves simply typing which end of the table needs to go to which track on a simple keypad. The system is far from cheap and takes a considerable time to set up (particularly if, like me, the layout is designed to transport to exhibitions) but, with the able assistance of my good friend Alastair MacNair and his lathe and milling machine, a set of parts needed to marry up the mechanism to my scratchbuilt table was manufactured. Having got the system working well, I can now agree with the Model Railroader article ‘you’d have to be a glutton for punishment to use any other system’. 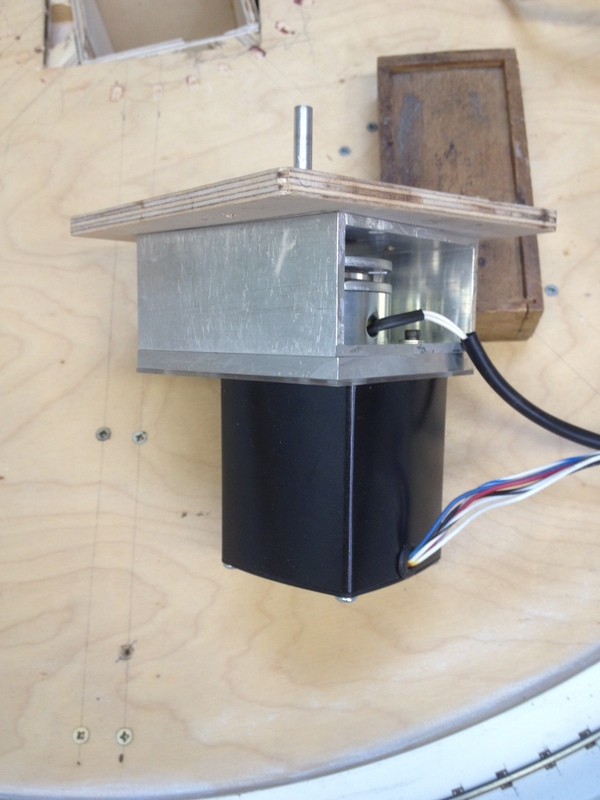 The PTCIII mechanism is mounted on its own sub-baseboard which indexes into a hole in the middle of the turntable well. 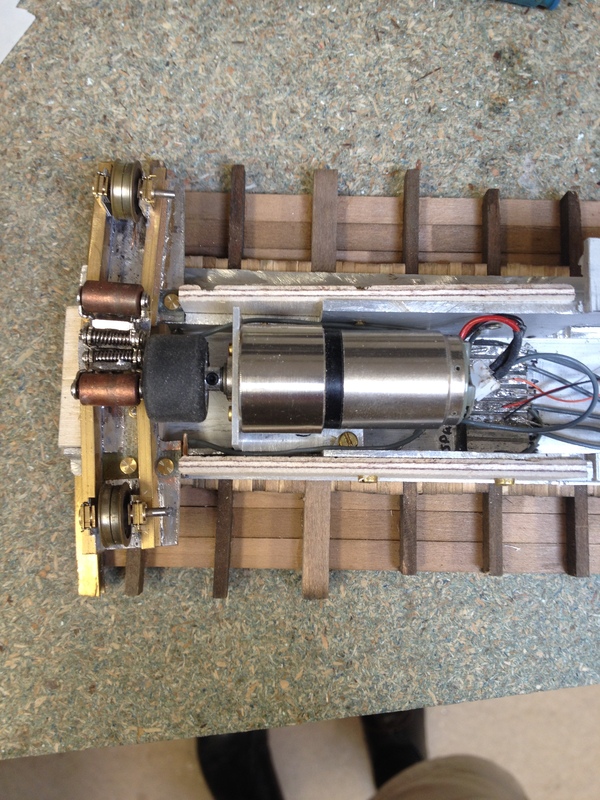 Track power is now via the rim rail and the table drive shaft and the wiring for the previous slot car wheel drive has been left in place as a back up in case of breakdown during a show – a non-working turntable essentially equating to a non-working layout! 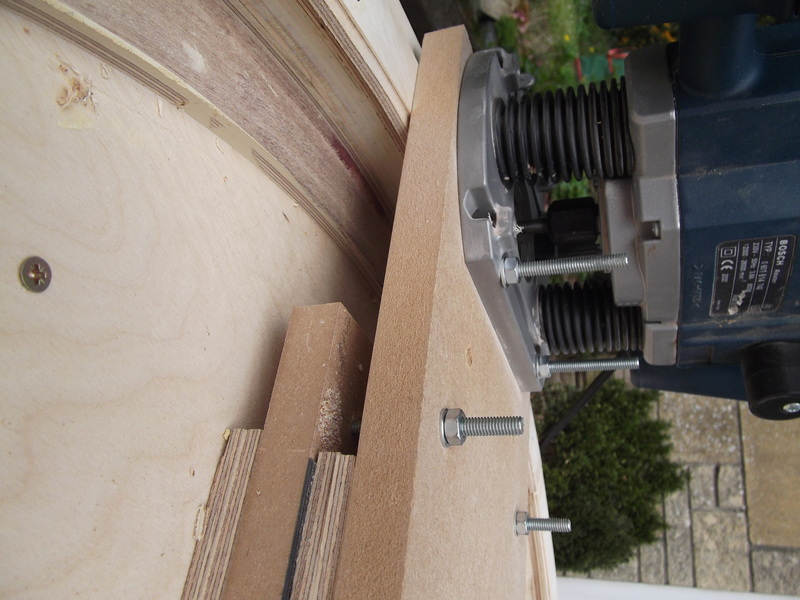 It would be a 5 minute job to refit the slot car wheel and motor – I hope I never have to do this! MORE TO FOLLOW AS CONSTRUCTION PROGRESSES!